STAMFORD—On good teams, heroes don’t apply for membership. They merely step up to the challenge at critical moments. On the Trumbull High School softball team, the Eagles’ family all take responsibility for the squad’s success. The Eagles kept soaring Friday as they downed Stamford High, 5-1, on the road to improve to 5-0 overall and 3-0 in the FCIAC. The defending Class LL softball state champions take that target on their collective backs quite seriously. 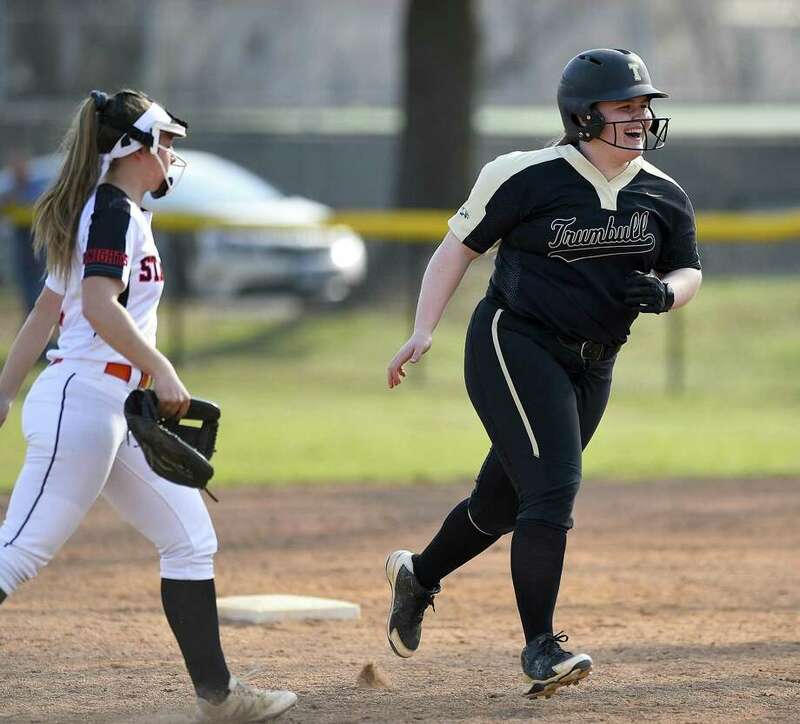 Trumbull got out of the first inning unscathed and kept grinding away to victory as the Eagles moved a step closer to qualifying (eight wins) for this year’s state tournament. The Eagles are fortunate to have two solid righthanded pitchers in Gell and freshman Mackenzie Bruggeman. Trumbull’s flawless defense meant Stamford had to fight for everything. The Black Knights collected nine hits but left eight runners on base. The Eagles’ offense was opportunistic as all five of their runs came with two outs. The contest turned in the third inning when senior Delilha DeStefano clubbed a three-run homer over the center field fence for 3-0. For Trumbull, Julia Huzi had a single, two walks and two runs scored. Alexa Adinolfi had three hits, one walk, one RBI and one run scored. Freshman catcher Cassi Barbato singled and drew three walks. On the warmest weather day of the season, Stamford High (1-4, 0-3 FCIAC) finished with nine hits. SHS scored in the seventh on Abby Hogan’s two-out, pinch-single. Dana Serricchio and catcher Amy Covino each lashed two hits. Freshman Jordan Rossi was 3-for-3. Rossi came on in relief and allowed two runs in the fourth. She followed with three scoreless innings. Records: Trumbull 5-0, 3-0 FCIAC; Stamford 1-4, 0-3 FCIAC. Batteries: T—Emily Gell (W) and Cassi Barbato. S—Rebecca Schwartz (L), Jordan Rossi (4) and Amy Covino. Highlights: T—Gell allowed no walks and struck out seven. Delilha DeStefano had a three-run homer. Julia Huzi reached base three times and scored twice.